A couple of weeks ago I saw this photo (above) posted on Facebook and nearly died! Well you have to admit it does look incredible. Then I nearly died again when I found out this chocolate cake is vegan and it’s being baked and served right here in Exeter where I live. Oh Lordy – I have to get me some of that cake and soon I’m thinking! 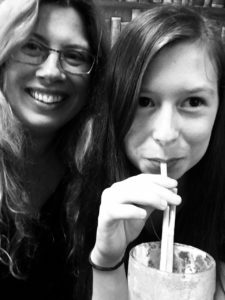 So I cannot believe it’s really happening when I’m there on Saturday afternoon with my vegan cake testing partner in crime, my 16 year old daughter Natasha. Gulliver’s cafe is in the centre of Exeter just off the main shopping street and it is not a veggie or vegan cafe. It’s just that the rather wonderful Charlotte who works there is vegan and has been trying out some plant-based options on the menu, and I hear these new additions are going really well. Apparently someone walked in one day last week first thing in the morning and just bought the whole vegan cake! As the cake is so massive (4 layers!) and so we don’t look like complete pigs, Natasha and I discreetly share a slice like the ladies we are (although obviously between you and me I could have happily eaten my own slice!). I get a decaf oatly cappuccino and my glamorous assistant opts for the oreo milkshake. The cafe is quite small and cosy with comfy sofas and chilled music, we like it. So the results – well this is certainly a mighty fine cake, all thanks to the talents of chef and cafe owner Gulliver (and what a brilliant name!). 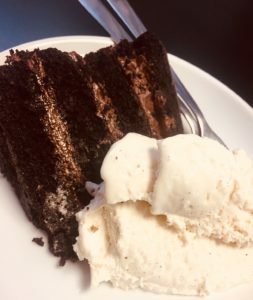 It’s not too rich so you can manage a slice yourself and, wait for it….it comes with vegan ice cream, oh hallelujah! The creamy butter icing is perfect and unlike with some cakes, there is lots of it. Natasha loves her oreo milkshake and the coffee….well I must tell you, their coffee is quite simply exquisite. Gulliver tells me they blend it themselves. They have several non-vegan cakes in the cafe but at the moment just the one vegan option. Gulliver and Charlotte would love to hear YOUR IDEAS though so they can add more – what’s your favourite vegan cake flavour? Either add a comment below or join our little poll over in our Super Savvy Vegan Facebook group where we are sharing vegan offers, bargains and more! P.S. 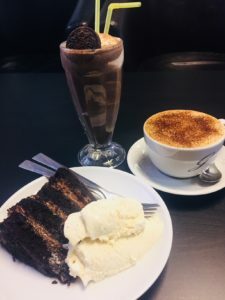 If you need to order some vegan cakes online check out my Lorama Cakes Review and if you live in Exeter and you have not yet been to the vegan chippy – why on earth not? We received complimentary food & drinks in return for this review but we must stress these opinions are absolutely 100% our own. Thanks again to Gulliver’s for being such lovely hosts. Next post: Free toys or free loo roll – the choice is yours! Wow! 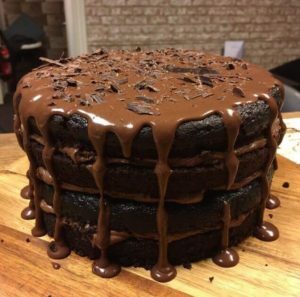 This cake looks incredible! There’s a restaurant near to my family up in Chorley that I suggest everytime we visit them PURELY on the basis that they serve a vegan chocolate brownie with Ice Cream. It’s divine! I find that desserts are the hardest things to get vegan in restaurants so I appreciate them a lot when I find them! Hope you both had a lovely time. We definitely did had a lovely time thank you. They’re so friendly in there.